Neuronal tracer enzyme of wheat germ agglutinin conjugated horseradish peroxidase (WGA-HRP) was employed to elucidate the detailed morphology of anterograde synaptic transport. After injection of WGA-HRP into the vagus nerve, sensory terminals in the nucleus of solitary tract (NST) were observed at the electron microscopic level using the tetramethyl benzidine and diaminobenzidine methods. In neuropil of the NST, electron-dense HRP-reaction product (HRP-RP) showed various types of lysosomallike structures. The RP characterized by containing membranous substance crossed synapses forming a mass without membrane surrounding the RP. Additionally, phenomena of anterograde synaptic transport of the RP and exocytosis of synaptic vesicles never occurred simultaneously. These findings raised the possibility of inducing synaptic transport of WGA-HRP at the stage of no neurotransmitter release, i.e. no activation of neuron. Therefore, further experiments were performed after co-injection of Rab3A-siRNA with WGA-HRP into the vagus nerve. This co-injection frequently resulted in not only suppression of vesicle trafficking to active zones and docking to pre-synaptic membranes but also abnormal aggregation of synaptic vesicles at terminals. Furthermore, synaptic transport of WGA-HRP, including secretion, followed by endocytosis of post-synaptic neurons was better seen in the experiments. Synaptic transmission on neuronal network is exclusively essential for the brain to function. Morphological analysis onto the functional implication at cellular and molecular levels is useful to understand the normal and pathological brain conditions. It is evident that synaptic vesicles move to axon terminals along microtubules under existence of kinesin superfamily [1-3] and chemical synaptic transmission based on exocytosis of synaptic vesicles is made at the pre-synaptic membrane with highly specialized structures forming contacts. However, some kind of protein, such as neuronal tracer enzyme of wheat germ agglutinin conjugated horseradish peroxidase (WGA-HRP), has also been well known to have anterograde synaptic transport [4-6]. It is believed that transport of WGA-HRP belongs to exocytosis as well as that of chemical synaptic transmission . In this point, the present study was performed to investigate whether the manner of anterograde synaptic transport of WGA-HRP is in accordance with that of vesicular transport and, in addition, changes of chemical synaptic transmission exert influence on transport of WGAHRP. Recent genetic analysis of neuronal protein function has demonstrated that Rabs, GTP-binding proteins, are generally involved in regulating membrane traffic and function in neurotransmitter release. Particularly, Rab3A is associated with presynaptic vesicles regulating vesicle targeting to active zones [8-10]. Therefore, Rab3A related proteins are considered useful for investigating the influence on synaptic transport of WGA-HRP. In this study, Rab3A-siRNA inhibiting neurotransmitter release was injected into the vagus nerve with WGA-HRP. This co-injection makes it possible to demonstrate the direct influence of Rab3A-siRNA in vivo. The present experiments were performed on 24 male Wistar rats (SLC, Hamamatsu, Japan), weighing 180-236 g. Animals were housed in separate cages and maintained under standard laboratory conditions (23 plus/minus 1 °C, 12-h light: 12-h dark cycle, food and water ad libitum). Experimental procedures were conducted in accordance with National Institute of Health (NIH) for Care and Use of Laboratory Animals. The Kagawa University Animal Care and Use Committee approved the procedures, and all efforts were made to minimize the number of animals used and their suffering. Animals were anesthetized with intra-peritoneal injection of chloral hydrate (490 mg/kg) for all surgical procedures. 0.4- 2.0 μl of a solution of 4% WGA-HRP (Vector Laboratries, Inc) on 14 rats or working solution of 1 nM Rab3A-siRNA containing four per cent WGA-HRP on eight rats were injected into the vagus nerve on the right side or both sides using a 10-μl Hamilton microsyringe under the operation microscope. Rab3A-siRNA stock solutions (3.0nM) were diluted by double distilled RNAase free water and stored in aliquots at minus 80 °C. Working solution (1.0nM siRNA/5μl) was mixed with each aliquots (1:4 v/v) and four per cent WGA-HRP. Rab3A selective siRNA mixture (3 target-specific siRNA for Rho/Rab subfamily, santa cruz, sc-36343) did not show any sign of behavioral toxicity. After a survival period of 24, 48, 72 h in the case of injection of WGA-HRP or 12, 24, 48 h in the case of co-injection, the animals were sacrificed by perfusion through the ascending aorta with 0.1M phosphate buffer (pH 7.4) followed by a fixative of one per cent paraformaldehyde and 1.25-2.5% glutaraldehyde in 0.1M phosphate buffer. The brain stem was removed from the skull and cut transversely into 200 μm-thick sections using a vibratome (Leica VT 1000S, Germany). The blocks containing the nucleus of solitary tract (NST) and dorsal motor nucleus of vagus nerve (DMV) were processed for demonstration of HRP-RP according to the TMB method  or heavy metal-intensified DAB method . In experiments using the TMB method, the sections were immersed in two per cent ammonium molybdate, dissolved in a five per cent solution of 0.2M acetate buffer, pH 3.3, for 30 min. Then, the sections were postfixed in buffered one per cent osmium tetroxide for two hours, block-stained in saturated uranyl acetate for one hour, dehydrated in a graded acetone series and embedded in an epoxy resin mixture as reported previously . In experiments using the DAB method, the sections were postfixed in buffered one per cent osmium tetroxide for two hours, block-stained in saturated uranyl acetate, dehydrated in alcohols and embedded in an epoxy resin mixture. As controls, two uninjected animals were used and blocks containing the NST region were taken. The blocks were reacted with TMB and DAB, and processed for electron microscopy in a manner similar to that described above. In all experiments, the NST region was identified by examination of toluidine blue-stained or unstained one μm-thick sections. Ultrathin sections of the region were cut and observed without further lead staining using a JEOL 200 CX electron microscope. In the case of injection of WGA-HRP into the vagus nerve, NST was confirmed easily by HRP-labeled fibers in the nucleus and labeled neurons in the DMV at 200 μm- and one μm-thick sections. Anterograde labeling was more dense in NST, with ipsilateral predominance, on the case of a survival period of 48 hours. HRP-RP was identified more clearly as electron-dense materials when lead citrate staining was omitted. Experiments using TMB method resulted in the RP showing lysosomal- or club-like structures without any membranes surrounding the RP in the axons and terminals. The terminals were characterized by containing one or more products (Figures 1A-D) and clusters of the RP around synaptic contacts (Figure 1E). 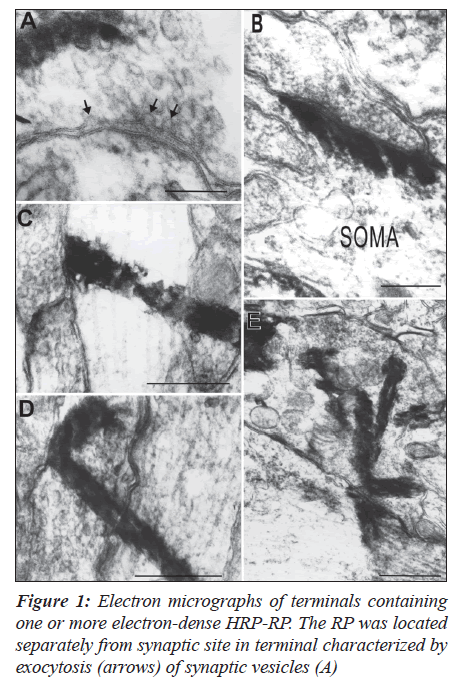 The RP was frequently observed from pre- to post-synaptic sites in continuity in the terminals participating in axosomatic (Figure 1B) and axodendritic synapses (Figures 1C-E). There were no remarkable changes of synaptic vesicles and membranes when the RP crossed the synapses. Furthermore, phenomena of exocytosis of synaptic vesicles and anterograde synaptic transport of the RP never occurred simultaneously (Figure 1A). Experiments using DAB method represented a different configuration of RP which might result from the use of a different pH or chromogen. This method apparently provided a more detailed morphology for anterograde transport of WGA-HRP at synapses. The RP showed membrane-bound lysosomes or lysosomal-like structures in axons (Figure 2A) and terminals (Figures 2B, C). Interestingly, the RP frequently contained membranous substance and formed a large mass consisting of two to five of the RP without vacuoles at terminals. Contacts between RP and the presynaptic membranes suppressed the membrane surrounding the RP. Furthermore, it was likely that indentation structure at synapses is formed to pass through the synapses (Figure 3A). Round or irregular shaped RP was observed to form synaptic transport (Figures 3B-D). Exocytosis of synaptic vesicles never occurred when the RP made contacts with However, the RP was frequently observed from pre- to postsynaptic sites in continuity in the terminals participating in axosomatic (B) and axodendritic synapses (C-E) without any changes of synaptic membranes and vesicles. TMB method: Calibration bar is equal to 0.2 μm in A and B, 0.5 μm in C and D, one μm in E.
Presynaptic membranes or crossed synapses (Figures 3A and B). The RP transported to postsynaptic neurons was not surrounded by membrane (Figure 2D). Co-injection of Rab3A-siRNA with WGA-HRP into the vagus nerve resulted in similar structure of RP to that identified in the case of WGA-HRP injection using the DAB method. In the present experiments, the RP was also observed to cross synapses at a survival period of 24 and 48 h with a slightly high frequency (Figure 4B). Many terminals containing the RP revealed not only suppression of vesicle trafficking to active zones and docking to pre Co-injection of Rab3A-siRNA with WGA-HRP into the vagus nerve resulted in similar structure of RP to that identified in the case of WGA-HRP injection using the DAB method. In the present experiments, the RP was also observed to cross synapses at a survival period of 24 and 48 h with a slightly high frequency (Figure 4B). Many terminals containing the RP revealed not only suppression of vesicle trafficking to active zones and docking to presynaptic membranes but also central concentration or weak aggregation of synaptic vesicles (Figures 4A and B). This co-injection also resulted in secretion of terminals followed by adsorptive endocytosis of postsynaptic dendrites. The RP in secretion was characterized by electron-dense homogeneous substance in contrast to that containing membranous substance (Figures 4C and D). In control rats, sections reacted with TMB and DAB showed no similar structure of RP at terminals in the neuropil of the NST to that described above. 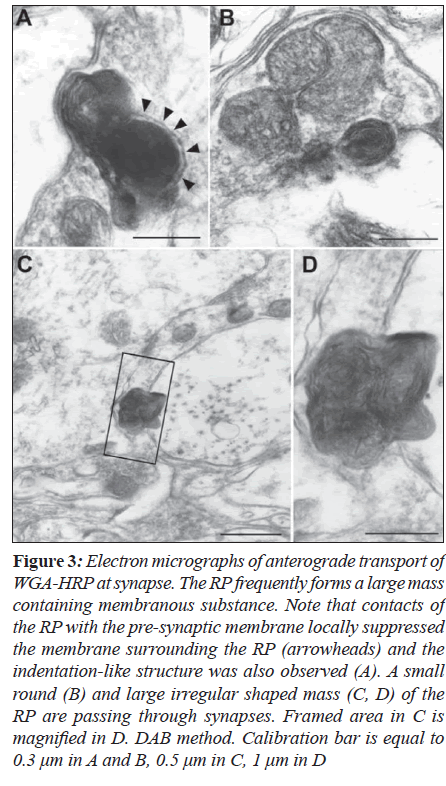 WGA-HRP has been employed for ultra-structural investigation of anterograde synaptic transport. Particularly, further observation in the present study was made to demonstrate the direct influence of Rab3A-siRNA at terminals in vivo. Experiments using TMB method resulted in elongated RP passing through synapses which was also identified in our previous study in the central nervous system . Although the RP located from pre- to post-synaptic sites in continuity,might be induced by leakage of WGA-HRP, there is no possibility of leakage because of any normal synaptic membrane structure and membrane bound RP demonstrated using DAB method. However, the possibility cannot be excluded that the elongated structure is TMB crystal growth across membranes. The membranous substance in the RP seems to be formed by endocytosis of lysosome for WGA-HRP which has an association with Golgi apparatus and similar to autophagic-like structure which shows degeneration of cytoplasmic components [15,16]. Although this structure , often containing vacuoles, has been reported in the previous study using WGA-HRP method, there is no description about synaptic transport . In the present study it is not concluded that the membranous substance is completely in accordance with autophagy. However, the membranous substance possibly including lipids might play some important role in passing through synapses. With respect to lectin, immunoblot analysis demonstrated that the 62-kDa lectin (WGA)-HRP conjugate (WGA: 22- kDa, HRP: 40-kDa) binds to specific carbohydrate moieties attached to glycoproteins and glycolipids expressed on surface plasma membranes . WGA has been used as an effective tracer in neuronal systems among a number of lectins because of common expression of WGA receptors on surface plasma membranes of most neurons . These findings suggest that synaptic transport of WGA-HRP is highly dependent upon lectin activity. Recent studies also have indicated a relationship between lectin activity and proteins of the annexin family. In particular, annexin IV binding to glycosaminoglycants in the presence of calcium ions is identified to be a lectin . Annexin V also has same lectin activity and is suggested to play certain roles in the central nervous system as a neurotrophic factor . The relationship between synaptic transport of RP and vesicular transport raised the possibility that synaptic transport of WGA-HRP is induced at the stage of no neurotransmitter release, i.e. no activation of neuron. In this point, Rab3A-siRNA injection into the vagus nerve is useful for investigating the phenomena. The present experiments revealed not only a loss of docked synaptic vesicles adjacent to the postsynaptic density but also abnormal aggregation of synaptic vesicles. These findings are well consistent with those reported in previous Rab3A knock-out mice [10,17,22,23]. Furthermore, in the present study, synaptic transport of WGA-HRP including secretion followed by endocytosis of dendrites was better seen after administration of Rab3A-siRNA. In secretion, the RP showed homogeneous structure which seemed to have no association with lysosome in contrast to membranous substance. 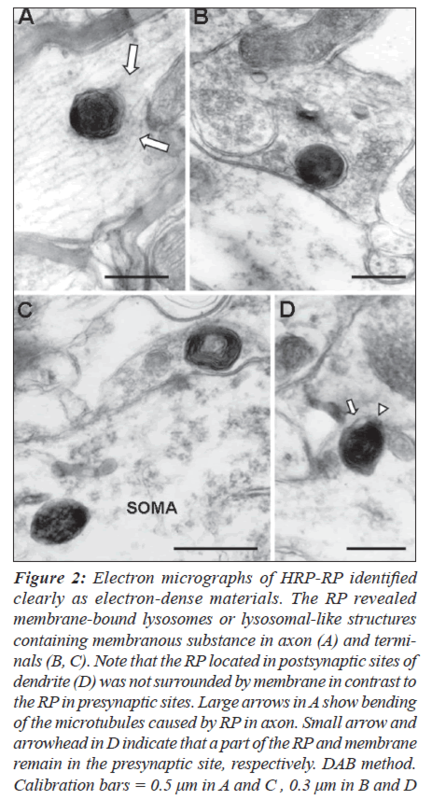 Although more detailed molecular analysis for the relationship between the synaptic membranes and protein endocytosed by lysosome should be studied in further experiments, co-injection of Rab3A-siRNA with WGA-HRP apparently makes it possible to demonstrate the direct influence of Rab3A-siRNA in HRP-labeled terminals in vivo. Indeed more studies are required to establish more details about the structures. 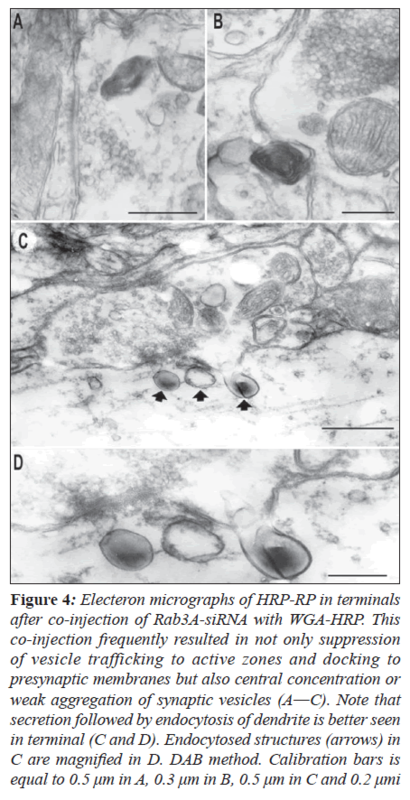 In the previous study investigating synaptic transport of WGA-HRP in the olfactory bulb after intranasal administration, Broadwell and Balin suggested that the RP is exocytosed from axon terminals for adsorptive endocytosis and possibly fluidphase endocytosis by postsynaptic neurons. The present findings of secretion are considered to be in agreement with their proposal. The authors greatly appreciate a critical review of an earlier version of this manuscript by Dr. Thierry D. Jacquin and Prof. Norihiko Maeda, and acknowledge the skillful technical assistance of Mr. Wakashi Nagata and Mrs. Mizue Fukutomi. This investigation was partly supported by the grant for science research from the Japanese Ministry of Education (No. 18591292). Hirokawa N, Takemura R. Kinesin superfamily proteins and their various functions and dynamics. Exp Cell Res 2004;301:50-9. Noda Y, Sato-Yoshitake R, Kondo S, Nangaku M, Hirokawa N. KIF2 is a new microtubule-based anterograde motor that transports membranous organelles distinct from those carried by kinesin heavy chain or KIF3A/B. J Cell Biol 1995;129:157-67. Okada Y, Yamazaki H, Sekine-Aizawa Y, Nangaku M, Hirokawa N. The neuron-specific kinesin superamily protein KIF1A is a unique monomeric motor for anterograde axonal transport of synaptic vesicle precursors. Cell 1995;81:769-80. Itaya SK. Anterograde transsynaptic transport of WGAHRP in rat olfactory pathways. Brain Res 1987;409: 205-14. Itaya SK, Van Hoesen GW. WGA-HRP as a transneuronal marker in the visual pathways of monkey and rat. Brain Res 1982;236:199-204. Quigg M, Elfvin LG, Aldskogius H. Anterograde transsynaptic transport of WGA-HRP from spinal afferents to postganglionic sympathetic cells of the stellate ganglion of the guinea pig. Brain Res 1990;518:173-8. Broadwell RD, Balin BJ. Endocytic and exocytic pathways of the neuronal secretory process and transsynaptic transfer of wheat germ agglutinin-horseradish peroxidase in vivo. J Comp Neurol 1985;242:632-50. Geppert M, Bolshakov VY, Siegelbaum SA, Takei K, De Camilli P, Hammer RE, et al. The role of Rab3A in neurotransmitter release. Nature 1994;369:493-7. Matteoli M, Takei K, Cameron R, Takei K, De Camilli P, Hammer RE, et al. Association of Rab3A with synaptic vesicles at late stages of the secretory pathway. J Cell Biol 1991;115:625-33. Schluter OM, Schmitz F, Jahn R, Rosenmund C, Sudhof TC. A complete genetic analysis of neuronal Rab3A function. J Neurosci 2004;24:6629-37. Mesulam MM. Tetramethylbenzidine for horseradish peroxidase neurohistochemistry: A non-carcinogenic blue reaction product with superior sensitivity for visualizing neural afferents and efferents. J Histochem Cytochem 1978;26:106-17. Adams JC. Heavy metal intensification of DAB-based HRP reaction product. J Histochem Cytochem 1981;29: 775. Takeuchi Y, Xie Q, Miki T, Matsumoto Y, Satriotomo I, Li HP, et al. Parabrachial inputs to Fos-immunoreactive neurons in the lateral central nucleus of amygdala activated by hypotension: a light and electron microscopic study in the rat. Brain Res Bull 2004;64:171-80. Lavail JH, Sugino IK, McDonald DM. Localization of axonally transported 125I-wheat germ agglutinin beneath the plasma membrane of chick retinal ganglion cells. J Cell Biol 1983; 96:373-81. Mizushima N. Autophagy: Process and function. Genes Dev 2007; 21: 2861-73. Rajawat YS, Bossis I. Autophagy in aging and in neurodegenerative disorders. Hormones 2008;7:46-61. Castillo PE, Janz R, Sudhof TC, Tzounopoulos T, Malenka RC and Nicoll RA. Rab3A is essential for mossy fibre long-term potentiation in the hippocampus. Nature 1997;388:590-3. Schmidt ML, Trojanowski JQ. Immunoblot analysis of horseradish peroxidase conjugates of wheat germ agglutinin before and after retrograde transport in the rat peripheral nervous system. J Neurosci 1985;5: 2779-85. Yoshihara Y. Visualizing selective neural pathways with WGA transgene: combination of neuroanatomy with gene technology. Neurosci Res 2002; 44:133-40. Tsujii-Hayashi Y, Kitahara M, Yamaguchi T, Kojima- Aikawa K, Matsumoto I. A potential endogeneous ligand of annexin IV in the exocrine pancreas. J Biol Chem 2002;277:493-9. Takei N, Ohsawa K, Imai Y, Nakao H, Iwasaki A and Kohsaka S. Neurotrophic effects of annexin V on cultured neurons from embryonic rat brain. Neurosci Lett 1994;171:59-62. Coleman WL, Bill CA, Bykhovskaia M. Rab3A deletion reduces vesicle docking and trasmitter release at the mouse diaphragm synapse. Neurosci 2007;148:1-6. Geppert M, Goda Y, Stevens CF, Sudhof T. The small GTP-binding protein Rab3A regulates a late step in synaptic vesicle fusion. Nature 1997;387:810-4.